In order to offer the most efficeint deliveries across Bournemouth, Poole, Dorset & Hampshire, we continually review our fleet of vehicles and the routes we travel to ensure we maximise the load, fuel efficiency, noise and time of our deliveries. From small to large 7.5 tonne refreigerated vehicles we have a current fleet of 15 vehicles which are renewed regularly, and are also subject to a strict maintenance regime. To keep costs down and to ensure our carbon footprint is at a minimum, all vehicles are emptied and the fridges turned off at the end of a working day, rather than leaving them connected to the mains. Products are returned to our custom built, state of the art warehouse fridge (which remains on 365 days a year) and then reloaded overnight for delivery next day. With an on site wash bay our vehicles are regularly cleaned inside and out to comply to our own strict standards, helping us ensure we remain EFISIS accredited. 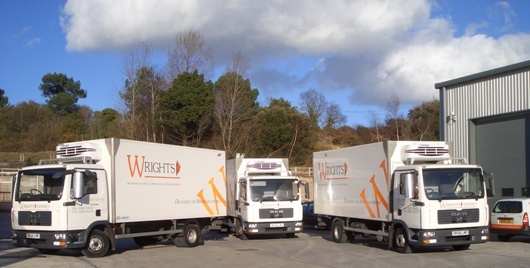 White in colour and with orange & black Wrights insignia, look out for one of our vehciles today.